While waiting for a shift change to complete their escape attempt the inmates at Arkham Asylum tell each other "scary stories" to pass the time. 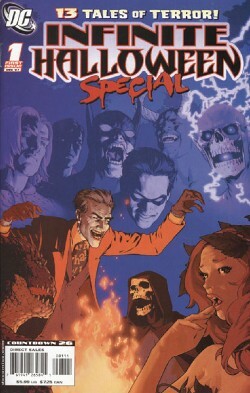 Scarecrow tells the tale of Zatanna's vengeance against a group who has poisoned children through their Halloween candy. Two Face tells the story of a group of werewolves that are taking down other werewolves in Gotham City. Robin investigates the slayings much to the chagrin of a GCPD detective. Robin survives an encounter with these Watchdogs and the detective takes the Dog's intended victim into custody. While driving the perp to headquarters the detective turns into a werewolf. The Mad Hatter spins the tale of a vampiric Batman from an alternate reality killing a couple while their young son watches. "What Can Scare the Main Man?" Phobia recounts a run in that she had with Lobo. During the course of a robbery at S.T.A.R. Labs Lobo burst on to the scene in search of Aragnok the Maleficent. Phobia uses her powers to stop the Main Man and is finally able to find the one thing that scares Lobo, which is a cute, little puppy. Dr. Destiny entertains his fellow inmates with a story of the new Aquaman. In the coastal town of Portsmouth live the three Morgan sisters, who have the reputation for being cold fish. Rumors abound of their liaisons with the young men of the town, but the unions never last. One night Aquaman comes ashore and is drawn into their home only to be trapped in a ritual. The Morgan girls were the product of a union between a sailor and a witch and held most of the men of Portsmouth in their sway, resulting in hundreds of hideous children being born and then placed in an underwater cave. The sisters tried to make a sacrifice of the young Aquaman but he proved too strong for them. Smashing through the floor he sent the sisters to a watery grave in the very same cave where the where they sent children to die. Mr. Zsasz recounts how the young Frankenstein's monster rebuilt himself after being torn apart by Black Adam. The Riddler tells his fellow inmates about his encounter with Batzarro during a heist he pulled in Metropolis. While Batzarro takes down the Riddler's men Lois Lane takes down the Riddler. Poison Ivy is next with a story about Lois and Jimmy stumbling upon zombies while investigating some dangerous cargo that Lex Luthor has brought into Metropolis. Superman arrives and finds that he is somewhat vulnerable to them through either magic or some kind of Kryptonite infusion. Once he is told that the zombies are not really alive Superman makes quick work of them, giving Jimmy and Lois their scoop. The next tale details a Halloween in Smallville. Clark, Lana and Pete go to pick up Tyler to take him to the dance and find him "dead", which turns out to be a trick. Tyler tells them of a manticore (a magical creature with a human head, a lion's body and scorpion's tail) but it is the revelation that he killed a field rat to wear its blood for his trick that shocks Clark and his friends. Tyler stomps off, only to be killed by the very manticore he was trying to scare the others with. Magenta tells a story of the Halloween that Wally West's children met their grandfather who had died some years before in a lab accident. Wally has always felt guilty since he could do nothing to prevent the man's death, but Ira West explains that the accident punched a hole through time, which led him to another place, time and discoveries. In a white flash he disappears after telling Wally that he loves him. Two men, Harley and Dennis, summon the evil Pumpkin Sinister to gain revenge on Daniel Cassidy (the Blue Devil) for mocking Dennisof them for sitting in a pumpkin patch each Halloween and humiliating Harley. With the help of the Enchantress Blue Devil defeats the Pumpkin Sinister and finds out that the humiliation Harley had suffered all those years ago was Daniel stealing the red-headed girl from him. Killer Croc relates the story of a stranger who tried to halt one of his murderous rampages. Croc kills the man but after eating the stranger's remains be comes sick and those remains come to life and animate the ground around Croc. Croc makes a runs for it and plows into a gas station causing a massive explosion that knocks him out long enough for the authorities to apprehend him. From a restaurant the stranger who had been "killed" watches the news cast and then leaves. The Joker takes in each story and asks if the inmates want to see something really scary. He turns around, his eyes glowing white which frightens the group enough to send them back to their cells. After they leave Deadman leaves the Joker's body. The Joker compliments him on his cleverness, which surprises Deadman since he is usually invisible to the human eye. The Joker explains that he's mad, not stupid and wishes him a Happy Halloween. Overall - 3: This is a tough one to review. It's not like I can give it a simple review since there are a plethora of creators involved, so I will take them one at a time and give an average rating overall. "Halloween at Arkham Opening and Ending" - 4: As bookends to serve the anthology I think Abnett and Lanning did fine with this story. The ending was kind of fun and had that wink-wink feeling to it. Plus I like Deadman, so there's that. I don't think there was much of a story here, but for what it was the Opening and Ending was satisfying. "Kcirt ro Taert" - 4: This was a nice mix of magical DC Comics characters and old EC Comics stories. The people who did wrong got what they deserved. Frankly this might have been more appropriate for a Spectre story, but Paul Dini likes Zatanna so it was Zatanna we got. A simple but satisfying story. "The Watchdogs" - 2: This story did nothing for me and the only thing I can hope for was that they aren't going to give these characters a mini-series or an ongoing. I didn't like this one at all. It was silly. The concept was decent but I hated the execution. I've also never been of the opinion that with everything Robin has been exposed to since taking up the mantle that werewolves wouldn't surprise him. The ending was lousy as well and if Arquettee and Dorfman were going for a shock ending they failed utterly. "Red Rain: Blood Lust" - 1: Does this story deserve a one? Maybe. Maybe not. It wasn't a bad story. It showed what a tragic and scary figure the Red Rain Batman was by doing to another child what had been done to him and there's some merit to that story being told. The reason I gave it a one? The little tag at the end telling us to check out the upcoming Red Rain special that is connected to COUNTDOWN. Yup, ruined it right there for me. "What Can Scare the Main Man?" - 4: My rating for this chapter is the reverse of the previous one. While I thought the writers stretched a joke a bit too thin this gets a four for having Lobo's worst fear turn out to be a cute little puppy. Was it accurate? No. Not at all, but it was funny and after the whole Red Rain thing I needed a laugh. "Children of the Deep" - 3: This wasn't a bad story. It was written well and had the right amount of creepy. You could everything coming a mile way but as a Halloween story it worked. Not one of Tony Bedard's best efforts but certainly not his worst. "...In Stitches" - 1: Was there a point to this story? Really, I'd like to know because I could find one. "The Light Kday Returns" - 4: For those of you who don't know Kal-El Bogdanove is the son of artist Jon Bogdanove. So Jon beat Nic Cage to the punch a decade or so before with naming your kid after Superman. I don't know if this is Kal's first stab at writing but if it was he came out swinging. He picked up Jeph Loeb's creation and ran with it to good effect. The story was amusing and well written. I'm glad it was included. "Strange Cargo" - 4: I had always wondered what a Superman fighting zombies story would be like. Now I know or at least I know how Steve Niles sees a Superman fighting zombies story. This wasn't a scary tale but I could see where the horror was intended. I also liked how once Superman knew the zombies weren't alive he took care of the problem in a heart beat. This was one of the better stories from the anthology. "Small Evil" - 2: This tale reminded me of a lousy episode of SMALLVILLE. Kind of like that one with Lana and the vampires that I hated so much. Outside of being boring and predictable I have issues with someone crying for help and Clark not even, you know, giving the situation a once over with those vision powers of his. I liked this story a lot better when it was called "The Boy Who Cried Wolf". "The Speed of Life" - 4: I really liked this story and on an emotional level I thought it was the best of the bunch. It was a ghost story...sort of. The ambiguity is what made it so enjoyable and the characterization that Waid infused into the characters was spot on. "The Pumpkin Sinister" - 3: I really don't know how to feel about this one. On one hand it was kind of a Charlie Brown gag that went on for eight pages. On the other hand I thought it was a funny Charlie Brown gag. I haven't read all that much by the writer. I think he co-wrote "Superboy" back in the day right before it got cancelled but since then I haven't seen him do much of anything. Dan DiDio. I mean the name is familiar but I can't quite place it. "Sometimes They Come Back" - 4: Ok, this gets a four simply for being a Resurrection Man story. Yeah that may seem silly, but Resurrection Man was an awesome character and series. Aside from that this was a solidly written story and was a kick to read. Sure Croc vomited the guy out, but hey that was just atmosphere. So on the whole this book gets 3 out of 5. It was enjoyable and worth the read but I can't say it was flawless. Art - 4: I enjoyed the art more than I did the writing. Trevor Hairsine and Kevin Conrad had a lot of mood in their bookends. Dustin Nguyen proves that his style matches this type of story rather than straight super-hero material. I didn't like the story but Bernard Chang's art was great on "Watchdogs". I like Kelley Jones and if he didn't do the Red Rain section I would have been a bit put out. Eric Battle and Sandra Hope actually come off looking like Todd Nauck in "What Can Scare the Main Man?" but I liked the result nonetheless. Even Peter Snejberg couldn't save "...In Stitches." I barely recognized Jon Bogdanove's artwork, but I liked it. I liked it a lot. I mean I liked his style on MAN OF STEEL, but this was great as well. Dean Ormston gave "Strange Cargo" the right atmosphere and drew some neat looking zombies. Like in stitches I don't think John Paul Leon could have saved "Small Evil." Ian Churchill and Norm Rapmund did a good job with "Pumpkin Sinister" and I dug their take on Blue Devil. I didn't like the way the Enchantress looked because, well, I liked her old costume better. Finally Tony Daniel and Jonathan Glapion were the final reason I liked "Sometime They Come Back." The art, on average, was better than the writing. It's not often that I feel that way, but there it is. Cover Art - 2: This was a lousy cover. All the great art on the inside and we get this lackluster piece on the outside. It was kind of a let down really.